In the several years I’ve been writing this blog, I’ve seldom written about the Russian planetary program as a whole. I’ve written about individual missions but I’ve not put all the pieces together since 2009. A request from a reader and the quiet announcement last month that NASA and its Russian counterpart Roscosmos are investigating options for joint Venus missions piqued my interest. For much of my information on the Russian space program, I have depended on writer and space historian Anatoly Zak and his RussianSpaceWeb.com. Fate has not been kind to the Russian planetary program since the breakup of the Soviet Union. Its Mars-96 mission was lost during a launch failure. Then in 2011, the Phobos-Grunt mission was lost after it failed to respond to commands following launch. Since then, the Russian program is following a two-pronged approach to rebuild its planetary program. For this decade, it is planning a series of solo lunar missions to build up its own design, testing, and operations capabilities. Simultaneously, it has built a partnership with the European Space Agency (ESA) to explore Mars. The earliest explorations of a potential partnership with NASA for Venus missions have just started. After reading Zak’s web site, ESA’s website, and reading a number of news accounts, what follows is the best picture I’ve been able to put together of Russia’s planetary plans. From what I can tell, these missions are concepts and not approved or funded missions. Launch dates therefore are likely to be notional for planning purposes rather than commitments. This is an ambitious list, especially for the early 2020s. Zak reports that the numbers of engineers and scientists to build, test, and operate these missions are small. Russia is enhancing the impact its resources have through partnerships with other space agencies. Still, several of the concepts seem likely to be dropped unless Russia invests substantially more resources to its program. Russia will need to develop substantial new capabilities to land the large 2018 ExoMars rover. It previously has not landed a large planetary probe on any world except on the very different Venus (and then as part of the Soviet Union series of landers that ended in 1986). ESA plans to share the technology it develops from its planned 2016 demonstration lander with Russia. Russia has previously discussed using the 2018 ExoMars landing stage as a long-lived weather and geophysical station. I have not seen any discussion of this recently. If this does happen and the station has a seismometer, joint seismological studies with NASA’s InSight mission could be done to improve upon the science either instrument could do on its own. In addition to Mars missions, managers for the European and Russian space agencies have stated that they are discussing Russian participation in ESA’s JUICE Jovian system-Ganymede orbiter mission. Russia could contribute the launch vehicle and in return be provided payload space for instruments on the JUICE orbiter or for a small Ganymede lander. · “Luna-25 is a small technology [demonstration] lander with a limited payload, which will target a high latitude [near polar] landing side in the southern hemisphere on the near side. 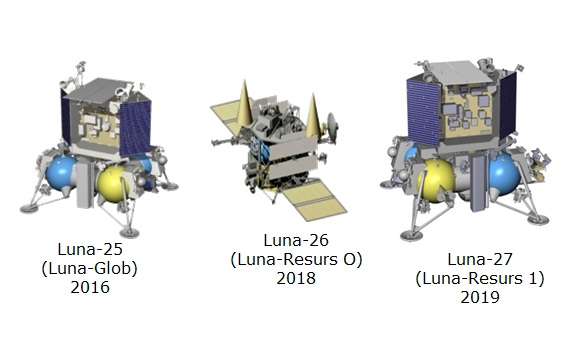 · “Luna-26 will be a polar orbiting spacecraft which will operate from one year at 100 – 150 km and then for 2 years at 500 – 700km altitude, providing communications relay capabilities for missions which follow. Venus missions were a major success for the Soviet Union’s planetary program. For the last decade, Russia has been investigating options for a return to Venus known as Venera-D. All versions of the plans I’ve seen have included a short-lived (few hours) lander and an orbiter. Various versions have also included balloons for atmospheric studies. Currently, a possible date of 2024 is shown for a mission with a single large, short-lived lander, a small lander that would survive a day, and two orbiters. Numerous studies have looked at the types of missions needed to advance Venus exploration, and they have concluded that concurrent and synergistic orbiter, balloon, and lander missions would be ideal. By cooperating, Russia and NASA could potentially substantially enhance the scientific return beyond what either could accomplish alone. The Boomerang Phobos mission would be a second try (after the failed Phobos-Grunt mission) to return a sample from the Martian moon. The Ganymede lander study is for an ambitious orbiter and soft lander mission that would be similar to a concept previously studied for a Europa orbiter and lander (see summary here). NASA studied a similarly capable Europa lander and concluded that it would be a highly complex mission. In my post on NASA's final 2014 budget, I could not find amounts for all of the Planetary Science research budget and worried that there might be a cut in this account. Two readers pointed out an error in my analysis. The President's full request for $130M for Research and Analysis will be funded. You can read the full, corrected post at, NASA Budget: Will there be money for the mortgage payments? NASA Budget: Will there be money for the mortgage payments? The two political parties in Congress have agreed on a budget for the US federal government for Fiscal Year 2014. While the President’s request for NASA’s Planetary Science budget was $1.218B, Congress has settled on $1.345B, an increase of $127.5M. However, there appears to be some significant downsides to the budget (at least from the initial information). 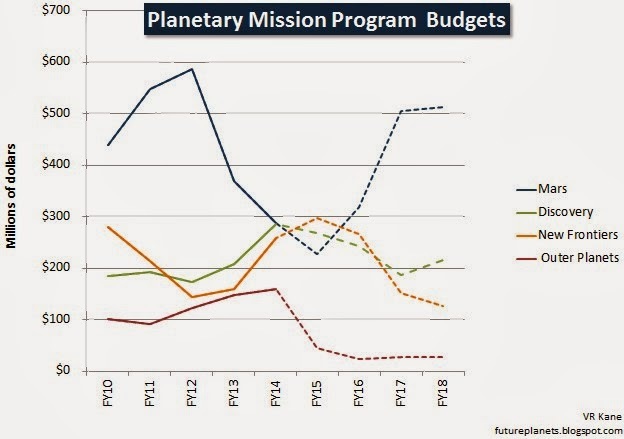 The winners in the final budget will be the accounts to fund future missions as shown by the chart below. The key budget increases are to pay for the 2020 Mars rover (~$55M increase), accelerate the start of the next Discovery mission (NASA's smallest category of planetary missions), and $80M for continued detailed studies of a Europa mission. 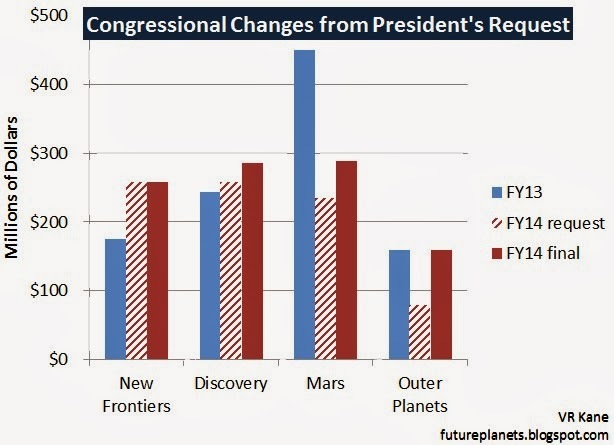 Changes in budgets that pay for future planetary mission development from Fiscal Year 2013, the President's FY14 budget request, and the final Congressional budget. What’s not clear is where the funds to develop the next Discovery mission ($425M to $500M) and Europa mission will come from. NASA could trade its planned next New Frontiers mission (~$1B) for the Discovery mission. Beyond that, NASA’s expected planetary budgets are already committed to pay for approved missions: the Mars InSight geophysical station (Discovery program mission), the asteroid OSIRIS-Rex sample return (New Frontiers program mission), and the Mars 2020 rover. Developing a Europa mission would require several additional hundreds of millions of dollars a year. If increasing the planetary budget in future years is Congress’ intent, then this would be welcome news. Otherwise, Congress is making down payments for missions that NASA would not have the budget to pay for (those mortgage payments referred to in the title of this post). Expected future budgets (dashed lines) would not support both the development a Discovery program (~$425-500M) and a New Frontiers program (~$1B) mission later in this decade or a Europa mission. Most funds later in this decade will shift to developing the Mars 2020 rover mission. Editorial thoughts: The best way to reduce risk for a future planetary mission is to spend substantial funds up front to define the mission, do preliminary design, and develop critical technologies. Together with funds from last year’s budget, the Europa Clipper mission will have had ~$160M in definition money before the mission is approved for development. This should substantially reduce the risk to the mission exceeding its expected development costs of ~$2B. However, $80M a year isn’t enough to carry the mission through development and to launch. Several hundred million more dollars would need to be added to the budget to do this. Budget Text: I’ve copied key relevant passages from the budget document below. “Planetary Science.-In lieu of any amounts included for specific Planetary Science activities in the House and Senate reports, the agreement provides $130,000,000 for Research and Analysis; up to $40,500,000 for Near Earth Object Observation; $285,000,000 for Discovery; $258,000,000 for New Frontiers, including $218,700,000 for OSIRIS-REx; $288,000,000 for Mars Exploration, including $65,000,000 for the development of the Mars 2020 Rover; $159,000,000 for Outer Planets, including $80,000,000 for a Jupiter Europa mission as described in the House report; and $146,000,000 for Technology, including up to the requested level for Plutonium-238 production. Jupiter’s moon Europa has been a priority destination for NASA’s planetary program since the mid-1990s. With a deep ocean trapped beneath an icy shell on top and the rocky surface below, Europa is believed to have the chemicals and energy needed to host life. Over the course of almost two decades, I’ve seen plans for a better, really cheaper, faster mission that just needed a lot of new technology to be developed. As if to balance that plan out, there was a plan for the planetary equivalent of a Battlestar Gallatica mission that was both unaffordable and also required technology that still doesn’t exist. I thought we were close with the Jupiter Europa Orbiter (JEO, circa 2010) until new cost estimates showed that it, too, was unaffordable. Now we have a proposed mission, the Europa Clipper, that doesn’t require substantial technology development and that has a cost estimate (~$2B) that puts it well within the cost range of NASA’s larger science missions. However, in today’s era of declining US federal budgets, the Clipper’s price tag is deemed unaffordable. Grunsfeld’s comments made me curious. Estimates for the last two serious Europa proposals have come in at $4.7B (JEO) and ~$2B (Clipper). Was a mission for ~$1B (the recommended cost cap for future New Frontiers missions) credible? In my post today, I report on the results of my thought experiment . To give you my conclusion first, yes, a Europa New Frontiers mission seems to be a credible idea to examine. However, I come away even more impressed with the Europa Clipper proposal and that’s the mission I want to see fly. 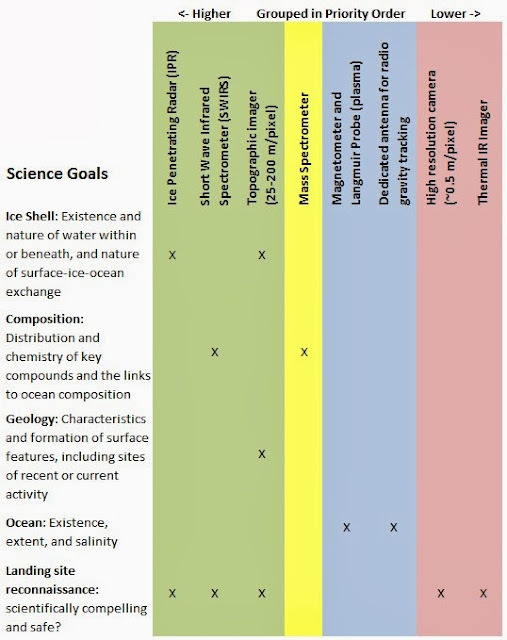 Depending on the instruments carried, a mission to Europa could study the surface morphology and composition, structure of the icy shell, or size and composition of the ocean and its interface to the rocky sphere below. Credit: JPL/NASA. The analysis below is somewhat wonkish as I document the assumptions and rational behind my thought experiment. Based on emails I receive from readers, getting any mission to Europa is a desire of many. I want to be clear on the analogies I’m drawing and assumptions I’m making. And remember that this is a thought experiment by an interested layman. It’s all just fun speculation until a team of planetary scientists and engineers does the real work to evaluate the feasibility and science return. A mission that orbits Jupiter faces a number of technical challenges. The spacecraft must be powered (and sunlight is dim at Jupiter). Jupiter possesses electronics-frying radiation (and Europa sits within the high radiation belt). That is in addition to the normal challenges of any planetary mission to operate a suite of instruments, store their data, and return the results to Earth. In some ways, Juno is a simpler spacecraft than one that would study Europa. Juno spins like a top to provide stability rather than having to provide the more expensive rigid and precise 3-D pointing that would be needed for the cameras and other instruments to study a moon’s surface. Juno’s instruments also produce relatively small amounts of data compared to the instruments required to study Europa. That additional data for a Europa spacecraft requires expensive data storage and a more capable communications system and more power for the spacecraft. In 2010, however, NASA completed studies of two New Frontiers-class missions to study Jovian moons as part of a planning process known as the Decadal Survey. I looked at those reports for clues about the capabilities a Europa New Frontiers mission might have in a credible design that meets the technical and environmental challenges of operating in the Jovian system. One of the reports described a multi-flyby spacecraft to study the volcanic moon Io (the Io Observer) and the other described a small orbiter for the icy moon Ganymede. Comparison of the overall capabilities of the proposed New Frontiers Io Observer mission and the proposed Flagship-class Europa Clipper mission. *Kilobits of data per second. Like the Europa Clipper mission, the Io Observer would perform multiple flybys of its target moon to study its features. The cheaper Io Observer mission, however, would carry far few instruments, return much less data, and encounter its moon many fewer times than the Europa Clipper mission. List of instruments and their masses for two New Frontiers missions proposed to study Jovian moons. Science goals and instruments for the proposed Europa Clipper mission. Masses for the instruments are shown at the end of this post. 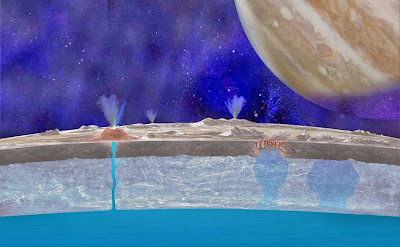 One option for a Europa New Frontiers mission would study the icy shell that covers the ocean and that has been shaped by the movement of ice blocks and plumes of ice and water within the shell. Understanding the icy shell would allow scientists to understand the forces that shaped the shell and that likely brought water from the oceans below to the surface. The topographic imager would be a camera that would image much of the surface in multiple colors at 25 to 200 m resolution. The ice penetrating radar would study the structure of the ice and any “bubbles” of water within the ice. The radar proposed for the clipper mission would be particularly capable. Operating in its shallow mode, it would penetrate just 3 kilometers into the shell but would have a vertical resolution of structures of 10 m. Operating in its deep mode, it would penetrate 30 km but with a vertical resolution of 100 m. Less capable, and lighter, radar instruments are possible. 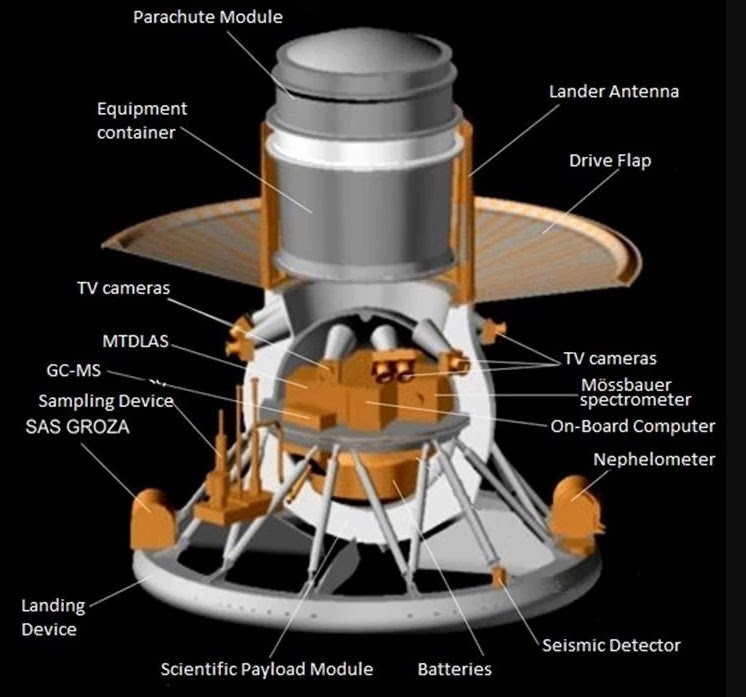 The European JUICE mission to the Jovian system will carry a radar instrument that is just 12 kg but that can penetrate just 9 km with a vertical resolution of 30 to 90 m.
A second instrument option would not include the heavy (and data and power hungry) radar instrument, but would instead focus on studying the composition of the surface with an infrared spectrometer and a mass spectrometer. (The latter would “taste” molecules blasted from the surface by Jupiter’s radiation or expelled from beneath the surface by possible plumes of gases.) A topographic imager again would study the surface geology which would also provide data on the forces that structure the icy shell. The magnetometer and plasma instrument would study the interaction of Jupiter’s powerful magnetic field with the salty water in the ocean to study the extent and salinity (important to understand the composition) of the ocean beneath the icy shell. Potential instruments to study the geology and composition of the surface ice as well as the hidden ocean. Recently, there’s been one reported observation of a plume of water being expelled by Europa. If this is confirmed, and the plumes are shown to be persistent and reliable, then a Europa mission might focus on studying those plumes. By doing so, it would study the composition of water either from reservoirs trapped within the ice or from the ocean below. Either way, this would be a unique opportunity to perform the kind of exciting science that the Cassini spacecraft has been doing with the plumes of Saturn’s moon Enceladus. Potential instruments to study possible Europan plumes. The mass for the dust analyzer is from the Decadal Survey Enceladus mission studies. Before examining the question of whether a Europa New Frontiers mission would be a good investment, I want to emphasize that the instrument lists given above are to illustrate possible capabilities to show that good science likely could be done within the limits of a New Frontiers mission. A professional science and engineering team studying such a mission would almost certainly come up with a better alternative than any of these. So, would a Europa New Frontiers mission be a good investment at ~$1B if ~$2B couldn’t be found to do the Europa Clipper mission? The answer would have to come from a study conducted by planetary scientists and engineers. I’ll suggest some of the questions they may ask to get to the answer. One way to ask the question is whether we would end up knowing far more about Europa than we do today following the Galileo mission of the 1990s. The members of the Decadal Survey answered ‘yes’ to this question for missions of similar capability to study Io and Ganymede. (The former is on the list of candidate missions approved by the Survey. The latter was left off that list based on the hope that a European mission called JUICE would be approved (which it has been) to orbit Ganymede.) I don’t see how a similar capability mission to Europa would be less valuable. The JUICE spacecraft will carry a more capable instrument suite than a New Frontiers spacecraft would carry. So would a New Frontiers spacecraft with six to ten flybys provide enough additional science over what JUICE would do with two flybys? Or maybe five JUICE Europa flybys? If the reported Europa plumes are real and persistent, there’s a hint that they operate only (or most strongly) at the point in Europa’s orbit where it is furthest from Europa. Unless the gods smile upon us, this is unlikely to be the same point where JUICE will encounter Europa. The New Frontiers craft could tweak its orbit to encounter the plumes where they are most active for repeated passes through them. It’s also possible for the two spacecraft to carry complimentary instruments. JUICE will have good, but heavy, instruments that would allow it to search for and study any Europan plumes from a distance and over time. A New Frontiers spacecraft then could do the up close measurements going to plume locations spotted at a distance by JUICE. A New Frontiers craft could also carry a dust counter and thermal imager that won’t be aboard JUICE to better characterize the plume structures and their sources. The last measure of whether a New Frontiers mission would be good enough would likely be the toughest. Would the science done be good enough that NASA and other space agencies could avoid having to refly a similar mission later at another $1B+ to meet the science goals? This is a different question than asking whether a second spacecraft to make different measurements would be needed. If two New Frontiers missions at ~$1B each did the same science as a $2B Clipper, then doing two cheaper missions is just buying on the installment plan. But what if those cheaper missions couldn’t do the right measurements or enough of them to answer the priority science questions? I don’t know the answer to this question, but suspect that the science definition team would wrestle with it. So what’s my personal takeaway from my thought experiment? A Europa New Frontiers mission seems like a credible idea to explore. However, it would take three New Frontiers-class spacecraft to fly all the instruments planned for the Europa Clipper (assuming ~40kg of instruments per spacecraft). The sum cost would be considerably higher than the cost for the Europa Clipper. In addition, the Clipper would have 45 flybys of Europa compared with just 6 to 10 flybys planned for the Io Observer (and by analogy for a Euorpa New Frontiers spacecraft). I am deeply impressed with the capabilities planned for the Clipper mission, and if it flies it will be awesome, and the right science will be done to sufficient depth that we won’t have to do it again. I want to see the Clipper mission fly. John Grunsfeld gets paid the big bucks to make the decision on whether to study and then propose a New Frontiers mission instead of the more expensive Europa Clipper. I just want to get to Europa for an in-depth study of that world, and I hope Grunsfeld and his managers can pull at one of these magic rabbits out of their hats. Appendix: Approved JUICE instruments and proposed Europa Clipper instruments. Several of JUICE’s instruments will be more focused on studying Jupiter and its magnetosphere than on the moons. Some notes on New Frontiers mission costs: In the past, NASA selected New Frontiers missions that had a cost target of ~$750M for costs that would be managed by the missions’ Principal Investigators (PIs): the spacecraft, instruments, mission operations, and data analysis. Additional costs borne by NASA included the launch, cost overruns (if any), increased costs due to factors such as delayed funding and schedule slips. (For example, NASA delayed the launch of Juno to pay the costs of other missions, which increased the time the Juno development team had to be paid.) The final quoted cost for the Juno mission is $1.1B with all these costs included. A number of New Frontiers missions were studied for the Decadal Survey, and all had engineering team cost estimates, which included launch costs. Four New Frontiers missions had full cost reviews that included launch costs and reserves for were termed as “threats”: overruns, delayed funding, and the like. Including all these costs, these four mission concepts were estimated to have total costs to NASA of $1.3B to $1.4B. Based on similarities in mission goals and broad design requirements, a simple multi-flyby Europa mission might have similar total mission costs. Based on the results of the cost estimates, the members of the Decadal Survey recommended that future New Frontiers missions have Principal Investigator cost caps of ~$1B. NASA would also need to cover launch costs and any cost overruns from project delays or PI cost growth. The commonly quoted cost estimate for the Europa Clipper, ~$2B, is an approximate mean of costs for several alternative implementations. Launch costs and additional costs from “threats” would be added costs to NASA. Given these, a New Frontiers mission might cost somewhat less than half the cost of a Clipper mission but would likely do much less than half the science (taking into account both a smaller instrument compliment, lower data rates, and fewer flybys). My take is that on a dollar per science return basis, the Europa Clipper is likely a much better investment than a New Frontiers mission. If the latter is formally studied, I’ll be interested to see if the professionals reach the same conclusion.